By now, my friends would know that education is an advocacy and a passion closest to my heart, the reason why I keep attending international conferences as well as sharing knowledge by writing articles for my blog, newspapers and books. 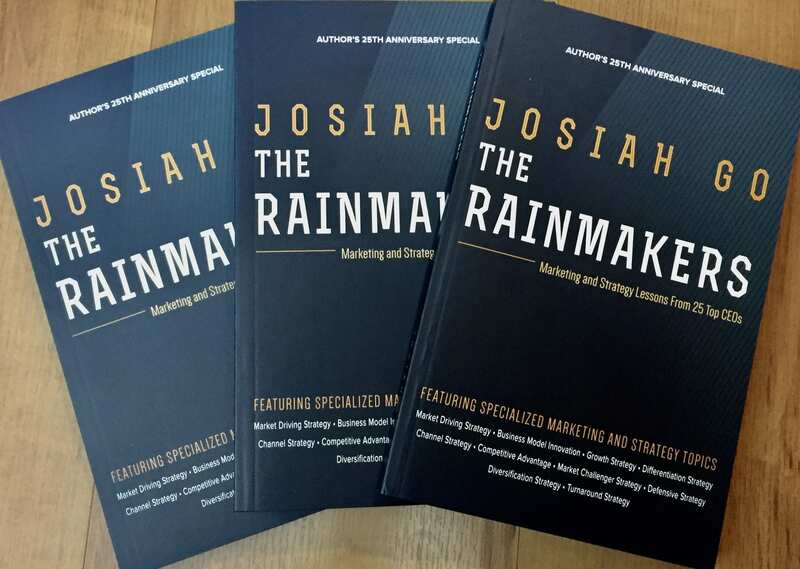 These books were written for marketing practitioners and entrepreneurs, mostly based on our experiences and knowledge gathered for several decades. Marketing and Strategy Lessons From 25 CEOs” lastMay 26, 2017. I have decided to launch a second book, ‘Principles and Practices in Marketing in the Philippine Setting’, my 15th since 1992. The book has 512 pages in 7×10 format, deviating from my usual 5.75×8.75 book size. I am blessed to have worked with many women in this book. My wife, Chiqui Escareal-Go, who is CEO of Mansmith Training Group, co-wrote the book with me. I could not have finished it without her help. Textile designer Mindy Molina did the cover design. Communications professional Monic Del Rosario edited the book. Flordeliza Cruz, general manager of Rex Printing, led the quick and efficient printing. Special mention and our sincerest appreciation to Mansmith Young Market Masters Award (YMMA) winner Aurora Mangubat-Suarez for giving us important advice on the book cover. Aside from the official endorsement of the Philippine Marketing Association (PMA) and the Association of Marketing Educators (AME) which we truly appreciate, Chiqui and I are proud of including the ‘Marketing Project for the Real World’ at the end of each chapter. We did not want marketing concepts applied to business alone, we wanted readers to apply concepts to the most important product — themselves! Readers will define their own personal branding, what value proposition they look in a lifetime partner, among others. There are also plenty of write ups about new market creation (market-driving strategy), latest research and statistics provided by Kantar and Nielsen, as well as interviews with top CEOs and CMOs. The P450 price for a 512-page book is a steal. It comes with a 10% discount for purchase of 5 copies or more, a great Christmas gift idea. The discount is applicable only on Nov 24, 2017, 7-9pm at the launch venue. My staff will be using a number system so you don’t have to fall in line in case you want your book autographed. Instead, you can take some free snacks and do networking while waiting for your turn to be called. There is an index of brands and companies at the end of this article so you can know if you or your competitors, part of over 500 brands, have been mentioned. If you can’t go, please send somebody to buy. As in all our previous books, net proceeds will go to charity. Chiqui and I thank you for your support.